Glycemic control in diabetic dogs and cats may be jeopardized by hospitalization for treatment of diabetic or nondiabetic disorders or routine health care interventions, such as minor surgical procedures or dental prophylaxis. Thus, a major challenge for veterinarians caring for established diabetics in the hospital is to provide needed care while avoiding significant disruption of glucose control. This article provides useful strategies and techniques for in-hospital glucose management in established stable diabetics. Glucose homeostasis is subject to complex physiologic regulation.1 Glucose in the blood has 3 major sources. Digestion of dietary carbohydrates, which produces glucose that is absorbed into the blood following a meal. Glycogenolysis biochemically breaks down glycogen, a stored form of glucose. Hepatic gluconeogenesis produces glucose from precursors, such as amino acids and glycerol. The latter 2 processes occur between meals or during fasting. Each process is subject to physiologic regulation at multiple steps, which maintains blood glucose within precise physiologic limits. In healthy animals, euglycemia is maintained by interplay between hormones that adjust glucose levels in the blood. Insulin is released from pancreatic beta cells, and is the principal hormone responsible for lowering blood glucose. Precise coupling between changes in portal vein glucose concentration and insulin secretion permits exquisite minute-to-minute glycemic regulation. The rate and amount of insulin release is modulated by a myriad of physiologic substances, including neurotransmitters, paracrine factors, and hormones. The incretin system, which includes glucagon-like peptide 1 (GLP-1) and gastric inhibitory peptide (GIP), is an important link between ingested nutrients and insulin release. The presence of various nutrients in the intestinal lumen stimulates the release of GLP-1 and GIP from specialized neuroendocrine cells scattered in the intestinal mucosa. Incretins act at specific receptors on the beta cell membrane to augment glucose-stimulated insulin secretion. The ability of insulin to lower glucose is mainly due to stimulation of glucose uptake by target tissues, especially muscle. After a meal, the I/G ratio is high (ie, portal vein insulin level is high) and the liver uses glucose for glycogenesis, inhibiting gluconeogenesis. Between meals, when glucose absorption from the gut and portal vein insulin concentrations are low, the low I/G ratio favors net hepatic glucose output via enhanced glycogenolysis and activation of gluconeogenesis. Diabetic dogs and cats lack the precise glycemic control found in healthy animals. Reduced beta cell mass and/or insulin resistance is associated with relative or absolute hypoinsulinemia and relative hyperglucagonemia—conditions that promote excessive glucose output from the liver, resulting in hyperglycemia. In addition, any increase in glucose that occurs during the absorptive phase of digestion cannot be blunted by insulin release, which contributes to postprandial hyperglycemia. Along with the detrimental effects of hyperglycemia, hypoinsulinemia also favors lipolysis, with resultant increases in blood levels of fatty acids and glycerol. Increased fatty acid availability leads to ketone formation when hepatic metabolism is overwhelmed, resulting in metabolic acidosis. The detrimental effects of hyperglycemia arise through several common pathways that cause systemic inflammation and alterations in endothelial cell function, which can lead to diverse immune, vascular, and neurologic abnormalities. Hyperglycemia of any cause can produce detrimental effects, but the effects are exaggerated with the chronic hyperglycemia that occurs in diabetes. The potential for hyperglycemic complications may be especially high in patients with unregulated diabetes, when glucose is substantially elevated throughout much of the day. Hyperglycemia presents a management challenge in hospitalized dogs and cats, not only in terms of effective diabetes control but also because hyperglycemia may have detrimental effects that are independent of diabetes (ie, produce the same consequences in nondiabetic patients). Disturbances in glycemic control should be anticipated any time a diabetic patient is hospitalized. 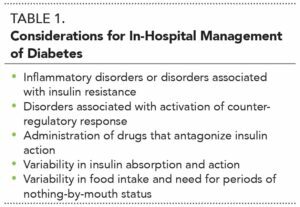 Clinicians should keep several principles in mind when considering strategies for managing diabetic patients during hospitalization (Table 1). Any deviation from a diabetic patient’s daily routine, however minor, may have a substantial effect on glycemic control. Possible disturbances arising directly from hospitalization include altered timing of insulin doses, inconsistent dosing, changes in diet, amount of food eaten or timing of meals, changes in daily activity, and effects of hospital environment on patient behavior. Glycemic control can also deteriorate as a direct effect of illness. Sick patients may have decreased fluid intake, reduced appetite, impaired mobility, or other problems that might affect diabetic control. In some cases, illness may have necessitated recent changes in insulin dose or dosing schedule. Glycemic control can be markedly disrupted when patients have disorders associated with insulin resistance. Insulin resistance in dogs and cats can be induced by any condition that leads to inflammation or initiates a counter-regulatory hormone response, such as trauma, shock, anesthesia, or surgery. Evidence for a role of inflammation in induction of insulin resistance is well established in humans but less so in dogs and cats. However, as in humans, the inflammation that accompanies such conditions as obesity, acute or chronic bacterial infection, immune-mediated disease, and cancer probably contributes in various degrees to deterioration of glycemic control in dogs and cats. While inflammation per se results in a hormonal response, certain conditions, such as naturally occurring hyperadrenocorticism and acromegaly, produce a marked hormonal response that induces severe insulin resistance. 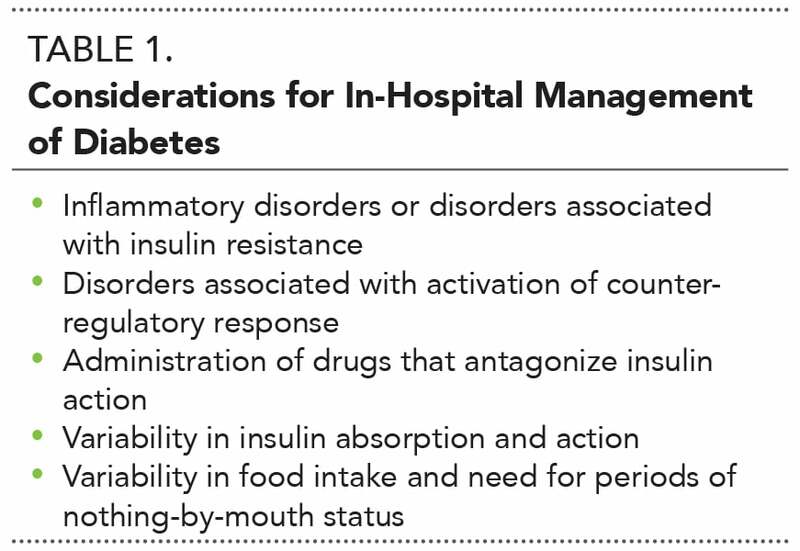 Another consideration when approaching patients with diabetes and a concurrent disease is whether management will require drugs likely to antagonize insulin or otherwise impede diabetic control. Many drugs known to affect blood glucose in diabetic humans are not commonly used in dogs or cats.10 However, glucocorticoids or cyclosporine, both of which may alter blood glucose, are indicated for treatment of various disorders that afflict diabetic dogs and cats, such as atopy, allergic lung disease, or inflammatory bowel disease. Use of these drugs is especially challenging at doses that cause immunosuppression. It is important to note that some drugs, especially glucocorticoid preparations, have the potential to interfere with glycemic control even when administered as topical preparations. As a rule of thumb, the need for any drug with a potential to disrupt glycemic control should be carefully considered and, if used, its effects on glycemia carefully monitored. Variability in insulin response is observed within individuals as well as between individuals, which makes it difficult to predict the effects of a particular dose and type of insulin over time. Some insulin preparations (eg, neutral protamine Hagedorn [NPH] formulations) show marked variability in pharmacodynamic effects after repeated standard doses. In humans, the response to NPH insulin varied by nearly 50% between individuals when compared with regular insulin given at the same dose.11 Substantial day-to-day variability can also occur in dogs and cats receiving subcutaneous insulin. It is not known whether illness exerts similar global effects on insulin resistance in dogs and cats, but it seems likely that similar changes are likely to occur in response to shock, trauma, sepsis, and similar systemic disorders. Frequent situations that may necessitate diabetes management during anesthesia and hospitalization include cataract removal, dental procedures, and orthopedic or oncologic surgery. In addition, intensive and careful glucose management is required for diabetic dogs or cats with concurrent disorders that necessitate hospitalization. No change in the insulin regimen may be needed for brief hospitalization or for simple or outpatient procedures. For patients that are hospitalized but not undergoing an anesthetic procedure, continuation of the typical insulin dose and type may be sufficient to maintain acceptable glycemic control. It is advisable to determine blood glucose several times each day during hospitalization to ensure the patient is not at risk for hypoglycemia. Although diabetic patients frequently undergo anesthetic procedures, veterinary guidelines for managing glycemia before and during the procedure have not been developed. Insulin Administration. In the absence of consensus guidelines, various insulin protocols for diabetic dogs and cats that will undergo anesthesia have been recommended. A frequently used protocol suggests administering a portion of the patient’s usual insulin dose on the morning of the anesthetic procedure: typically, the morning meal is withheld and the patient administered a quarter to a half of the usual insulin dose (most often an intermediate- or long-acting insulin formulation) by subcutaneous injection. Some protocols substitute regular insulin on the morning of the procedure in lieu of a longer-acting formulation. Blood Glucose Monitoring. Blood glucose should be measured before the induction of anesthesia and frequently during the anesthetic procedure, when it is vital. Monitoring every 15 to 30 minutes during anesthesia and during recovery is recommended, and even more frequent glucose checks may be needed if blood glucose is fluctuating. Careful monitoring can identify developing hypoglycemia and permit intervention in the event of hypoglycemia or unacceptable hyperglycemia. The optimal blood glucose concentration during anesthesia and recovery has not been determined, but 100 to 250 mg/dL is a useful target range based on clinical experience. Insulin Selection. Administration of a morning fractional insulin dose and frequent monitoring result in a safe anesthetic procedure for most stable diabetic patients. However, intermediate- or long-acting insulin formulations, which most dogs and cats receive as their daily insulin, are not the best choice when precise glycemic control is needed. The pharmacodynamic effects of long-acting preparations (NPH, protamine zinc insulin, insulin glargine, and others) change when a lower insulin dose is given, and insulin absorption, action, and elimination may be altered during anesthesia. Some intermediate- and long-acting formulations may show a pronounced peak in effect, which increases the risk for an acute hypoglycemic event. Taken together, these factors introduce an element of unpredictability when subcutaneous insulin is used before an anesthetic procedure. 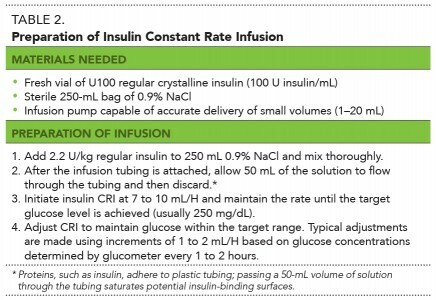 For these reasons, constant rate infusion (CRI) may be the preferred method for insulin administration when precise glycemic control is needed (see Insulin Infusion). Insulin infusion is the most useful method for acutely restoring euglycemia and maintaining blood glucose within a target range. In human medicine, insulin infusion is the preferred method for glycemia management in the perioperative period and for hospitalized patients when long-acting insulin preparations are not indicated. Provision of regular insulin or an ultra-short-acting analogue insulin by intravenous injection (ie, CRI) inhibits lipolysis and ketone formation and prevents unacceptable or dangerous levels of hyperglycemia. Administration of insulin by CRI is described in dogs and cats with diabetic ketoacidosis (DKA) but can be used to manage glycemia in hospitalized patients as well. The most frequently used protocols entail CRI of regular crystalline insulin (Table 2). CRI using an ultra-short-acting insulin has been used successfully in dogs with DKA, and may provide advantages in veterinary patients.15,16 Ultra-short-acting preparations, such as insulin lispro or insulin aspart, have a more rapid onset and shorter duration of action than regular insulin, characteristics that prove useful when rapid and precise regulation of glucose is needed. Insulin CRI is used to prevent hyperglycemia and maintain glucose within the target range during the infusion period. Insulin CRI, given appropriately, maintains the patient within an acceptable glycemic range, while avoiding hypoglycemia. Able to prevent unacceptable levels of hyperglycemia. A safe upper limit of 200 to 250 mg/dL is recommended for dogs and cats, but a lower range might be the target in select circumstances, such as when hyperosmolality is a concern or when attempting to avoid glucose-mediated diuresis. When blood glucose is below 250 mg/dL, the renal threshold for glucosuria is not exceeded, which decreases osmotic diuresis and solute loss and minimizes clinical signs of diabetes. Glucose targets less than 250 mg/dL may provide better daily glycemic control but require frequent CRI adjustments and increased monitoring to avoid hypoglycemia. When used to support a stable patient undergoing elective or uncomplicated anesthesia, the CRI can be discontinued at the end of the procedure and the patient allowed to recover normally. In most cases, the patient can return to the normal insulin routine beginning with the next scheduled dose when the patient is able to eat and drink normally. Unstable patient requiring intensive care. Once a patient is stable, alert, and able to eat regularly, the CRI is discontinued to allow the effects of insulin to wane. When regular insulin is used in the CRI, the glucose-lowering effects of insulin dissipate and hyperglycemia returns within 4 to 6 hours after the CRI is stopped. Hyperglycemia returns more quickly when the CRI contains ultra-short-acting insulin, such as insulin aspart or insulin lispro. With some training and experience, most practices can effectively use insulin CRI during anesthesia or for treatment of hospitalized diabetic patients. Requirements for specialized equipment (a dedicated infusion pump) and personnel for frequent patient monitoring are drawbacks of using insulin CRI, but improved glycemic control and the possibility of reducing hospitalization time and costs offset these disadvantages. In addition to patients undergoing prolonged anesthesia, critically ill patients or diabetic patients requiring prolonged hospitalization also need careful and precise glucose control. Monitoring should be performed as often as needed to ensure the patient’s glycemia is controlled. Monitoring every 4 to 6 hours may be sufficient if the patient is stable and glucose fluctuations are not likely or expected, but monitoring frequency should be adjusted when rapid glucose fluctuations are anticipated. As with the anesthetized patient, insulin needs for critically ill diabetic patients are difficult to predict, and subcutaneous administration of intermediate- and long-acting insulin formulations may be a poor choice. 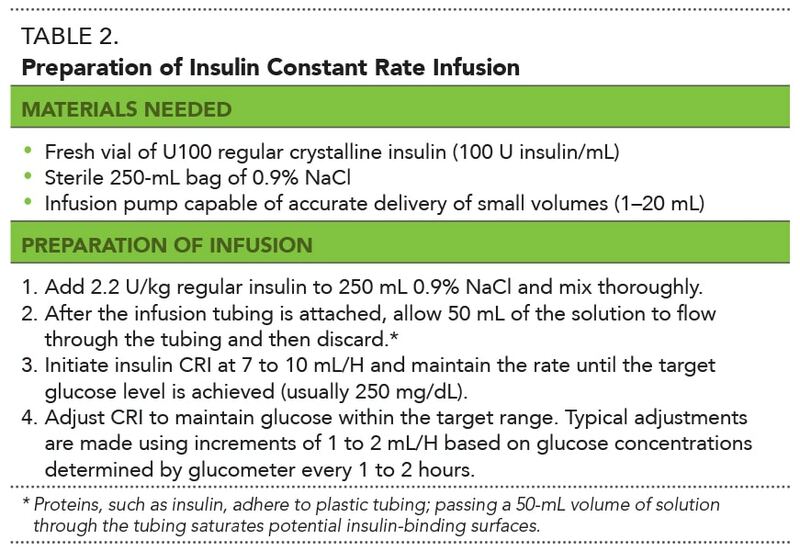 When glycemic control is a priority (in hospitalized, ill diabetic patients), administration of depot insulin preparations should be suspended and insulin needs met by CRI using a short-acting insulin (see Insulin Infusion). The use of intermittent intramuscular insulin administration may be an alternative when CRI is not possible or practical but, in my experience, this approach provides less precise control compared with CRI. Further, since the use of IM insulin does not preclude the need for frequent monitoring, staffing is still needed to provide adequate patient care regardless of the insulin protocol selected. Postoperative patients and those recovering from illness are transitioned to their routine insulin regimen once they can maintain hydration and eat normally. Follow-up should include assessment of diabetic control with adjustments as needed to achieve management goals. Maintaining glycemic control during anesthesia and hospitalization is a challenge when treating diabetic dogs and cats. Persistent hyperglycemia can result in serious complications, including inflammation, endothelial dysfunction, and neuronal damage. Efforts at control of hyperglycemia in hospitalized diabetic patients must consider possible effects of the hospital environment, concurrent illness, and the intrinsic biologic variability of insulin. Strategies for managing hyperglycemia in hospitalized diabetics range from conservative to more intensive glycemic control. Insulin CRI may be a useful option when precise control of glycemia is needed, such as during an anesthetic procedure or in the intensive care unit. Shrayyef MZ, Gerich JE. Normal glucose homeostasis. In Poretsky L (ed): Principles of Diabetes Mellitus. New York: Springer, 2010, pp 19-35. Aronoff SL, Berkowitz K, Shreiner B, Want L. Glucose metabolism and regulation: Beyond insulin and glucagon. Diabetes Spectr 2004; 17(3):183-190. Frisch A, Chandra P, Smiley D, et al. Prevalence and clinical outcome of hyperglycemia in the perioperative period in noncardiac surgery. Diabetes Care 2010; 33(8):1783-1788. Brady CA, Hughes D, Drobatz KJ. Association of hyponatremia and hyperglycemia with outcome in dogs with congestive heart failure. J Vet Emerg Crit Care 2004; 14(3):177-182. Hardie EM, Rawlings CA, George JW. Plasma-glucose concentrations in dogs and cats before and after surgery: Comparison of healthy animals and animals with sepsis. Am J Vet Res 1985; 46(8):1700-1704. Clement S, Braithwaite SS, Magee MF, et al. American Diabetes Association Diabetes in Hospitals Writing Committee. Management of diabetes and hyperglycemia in hospitals. Diabetes Care 2004; 27(2):553-591. DeClue AE, Nickell J, Chang CH, Honaker A. Upregulation of proinflammatory cytokine production in response to bacterial pathogen-associated molecular patterns in dogs with diabetes mellitus undergoing insulin therapy. J Diabetes Sci Technol 2012; 6(3):496-502. O’Neill S, Drobatz K, Satyaraj E, Hess R. Evaluation of cytokines and hormones in dogs before and after treatment of diabetic ketoacidosis and in uncomplicated diabetes mellitus. Vet Immunol Immunopathol 2012; 148(3-4):276-283. Altabas V. Diabetes, endothelial dysfunction, and vascular repair: What should a diabetologist keep his eye on? Int J Endocrinol 2015; 2015:848272. NPS MedicineWise. Diabetes, type 2. Medicines that affect blood glucose levels. Available at nps.org.au/conditions/hormones-metabolism-and-nutritional-problems/diabetes-type-2/for-individuals/medicines-and-treatments/medicines-that-affect-blood-glucose-levels. Heinemann L. Variability of insulin absorption and insulin action. Diabetes Technol Ther 2002; 4(5):673-682. Fleeman LM, Rand JS. Evaluation of day-to-day variability of serial blood glucose concentration curves in diabetic dogs. JAVMA 2003; 222(3):317-321. Alt N, Kley S, Haessig M, Reusch CE. Day-to-day variability of blood glucose concentration curves generated at home in cats with diabetes mellitus. JAVMA 2007; 230(7):1011-1017. Bilicki KL, Schermerhorn T, Klocke EE, et al. Evaluation of a real-time, continuous monitor of glucose concentration in healthy dogs during anesthesia. Am J Vet Res 2010; 71(1):11-16. Sears KW, Drobatz KJ, Hess RS. Use of lispro insulin for treatment of diabetic ketoacidosis in dogs. J Vet Emerg Crit Care 2012; 22(2):211-218. Walsh ES, Drobatz KJ, Hess RS. Use of intravenous insulin aspart for treatment of naturally occurring diabetic ketoacidosis in dogs. J Vet Emerg Crit Care 2016;26(1):101-107. Thomas Schermerhorn, VMD, Diplomate ACVIM (Small Animal Internal Medicine), is a professor of small animal medicine at Kansas State University. Dr. Schermerhorn’s research focuses on diabetes and glucose metabolism in dogs and cats. His clinical interests include all aspects of canine and feline endocrinology, especially diabetes. He received his VMD from University of Pennsylvania, and completed an internship at South Shore Veterinary Associates and a small animal internal medicine residency at Cornell University.